A greatly expanded lexicon of the language Nadsat, as used by the delinquent Droogs in the novel “A Clockwork Orange”, is among the items which have recently been unearthed in a vast archive of the work and life of novelist Anthony Burgess, which is due to go on display at next year’s 50th anniversary of the novel. Considered by some to be one of the most controversial modern works in the English language, “A Clockwork Orange” was first published in 1962 and concerns a Vicious teenage thug named Alex who along with his gang of “Droogs” goes around committing violent crimes until he gets caught and sent to prison for a very long time. Whilst In prison he volunteers to undergo a contoversial new treatment known as the Ludovico Technique, which he thinks will be an easy way out and which the authorities are hoping will cure his vioent tendancies. Although he is most famous for writing this novel, Manchester-born Anthony Burgess, who died in 1993, also wrote at least 33 novels, 25 works of non-fiction, two volumes of autobiography, three symphonies, and more than 250 other musical works including a piano concerto, a ballet and stage musicals. The New Lexicon will be displayed alongside the libretto, a score for an unseen opera about Leon Trotsky, and a script for an unmade TV series about Attila the Hun. Recently five song lyrics written by the author were set to music by the University of Manchester’s Head of Composition, Dr Kevin Malone, and performed for the first time as A Clockwork Operetta on the campus, the place where Burgess graduated in English Literature in 1940. The world premiere was performed by all-female ensemble the Ebb Trio, dressed as droogs, at the University’s Martin Harris Centre. Dr Malone’s music draws on Beethoven, Burgess’s musical hero, but also makes reference to the novelist’s popular stage version, which was performed by the Royal Shakespeare Company in 1990. Burgess also wrote a play about the life of Napoleon, which will have its premiere on BBC Radio next year. In 1969 Burgess also wrote a screenplay for Stanley Kubrick’s film version of “A Clockwork Orange”, which was ultimately rejected by the director, but he did read it before writing his own version, and although Kubrick’s violent rendition was critically acclaimed, it was withdrawn from cinemas by the director himself for 27 years until his death in 2001. Happily Burgess’ original Screenplay for the film survived and is among the items which have been discovered in the archive. It is laced with new Nadsat words which were not used in the film. Nadsat, being a melding of English and Russian, which the droogs spoke in the original novel. More work is also coming to light every day. Recently another piece of music was discovered, as well as a pair of driving gloves belonging to Liana and a tape recording for his music The Eyes of New York, which is not transcribed anywhere. The extraordinary resource, which has been left to the International Anthony Burgess Foundation by Burgess’s widow Liana, also includes hundreds of papers, letters and original compositions, and has been newly housed in a renovated building in a regenerated area of the city and is a bulging testament to the writer’s prolific literary and musical talent. 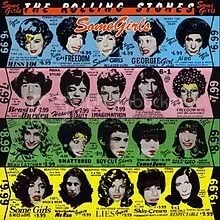 The Album “Some Girls” is re-released by the Rolling Stones on 21st November and With this album they stripped their trademark sound of all the excesses and went back to a more basic and immediate sound. This 1978 release was their response to Punk and Disco and offers an impressive variety of styles, and was an uncompromising attempt to incorporate 1978 pop techniques into the band’s familiar sound. The album opens with the disco sass of “Miss You” and closes with the self-destructive punk of “Shattered”. (Both songs, remain live showstoppers.) So the Stones declared credibility in the dance circuit without sacrificing their hard-rock reputation. Though the anti-love “Beast of Burden” and the stylishly slow “Just My Imagination (Running Away with Me)” continue to rack up the most airplay, the obscurities stand up surprisingly well. Worth replaying: Keith Richards’s rickety rocker “Before They Make Me Run” being a highlight. Whilst some Girls not be considered as one of their top 5 classic Albums by some, I think the songs are uniformly good with great tunes and plenty of attitude. I would like to get The latest film from the Pixar Animation studios, “Cars 2, which is released on DVD today (21st November). In which Lightning Mcqueen finds himself being challenged by a rival to enter the forthcoming World Grand Prix which has been organised by an Oil Tycoon named Miles Axlerod in order to promote a new alternative fuel called Allinol. Unfortunately whilst at the first race, Mater gets himself into a whole heap of trouble when he unwittingly finds himself involved in the world of high espionage after being mistaken for a secret agent by a British Agent named Finn McMissile (Michael Caine) and his partner Holley Shiftwell. He then finds himself in even greater danger when he is chased by villainous thugs who are after a Top Secret Device and they think he’s got it.